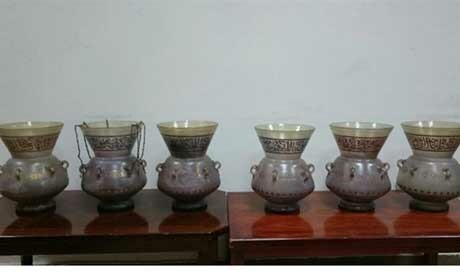 Egypt's Tourism and Antiquities Police has recovered six Khedivate-era lamps that were stolen late December from the El-Refai Mosque in Cairo’s El-Khalifa district, with the culprits behind the theft arrested earlier this week, the Ministry of Antiquities said on Tuesday. 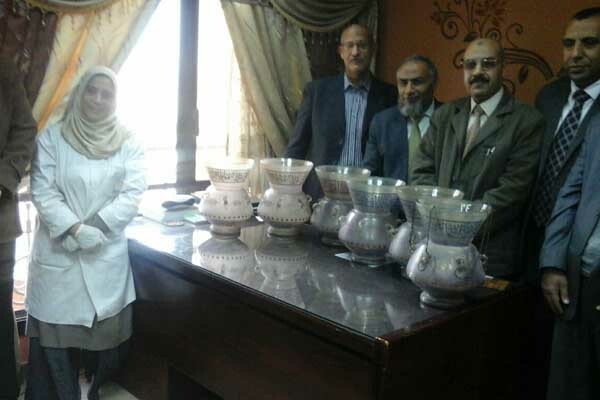 El-Saeed Helmy, head of Islamic and Coptic Antiquities Department at the Ministry of Antiquities, told Ahram Online that a committee of archaeological experts has confirmed the recovered lamps’ authenticity. Mona Ahmed, a restorer at the Museum of Islamic Art who specialises in glass artefacts, told Ahram Online that the lamps are in good condition, and that they bear the rank of Khedive Abbas Helmy II, who ruled Egypt and Sudan from 1892 to 1914. The Tourism and Antiquities Police say that the people who stole the lamps were working with a film crew that was shooting inside the mosque. The police arrested two suspects, one of whom is an antiques dealer, while a third is at large. Police say the suspects intended sell the lamps for EGP 900,000. Helmy says the six lamps were among 15 adorning the ceilings of the mausoleums of King Fouad and Princess Ferial at El-Refai Mosque. The lamps, which date to 1910, are made of glass adorned with a Quranic verse written in Mameluke raised script. “Allah is the Light of the heavens and the earth. The example of His light is like a niche within which is a lamp,” says the verse from the Surat An-Nur. Helmy says the lamps were recovered quickly due to the swift action by the antiquities ministry, which was quick to report the theft, and that the minister of antiquities has taken measures to prevent similar thefts in the future.